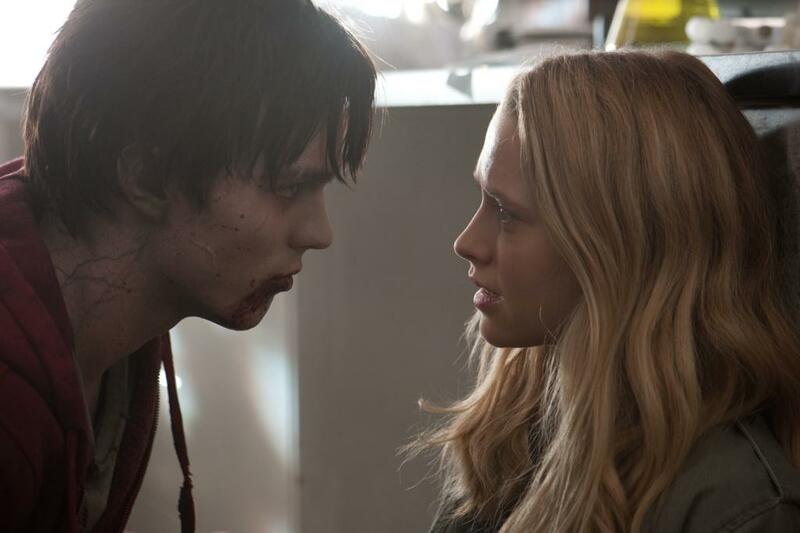 Zombie meets girl in ‘Warm Bodies’. Any film that is done well demands admiration, even if it goes against one’s personal tastes. Warm Bodies, a film of exceptional craftsmanship, exemplifies this concept to the tee. So while it falls squarely within the zombie genre, even viewers who don’t care for these types of films will be hard pressed not to have a good time. With that said, it is a bit too straightforward, and there are few surprises to be had, especially for audiences that have seen any of the marketing. The world has been overrun by zombies. One of them is R (Nicholas Hoult), a young man who wanders the airport, internally lamenting his existence and worrying about his inevitable future as a “Boney”: a skeletal-like zombie that has completely lost all humanity. Humans still exist, however, but they are walled off in a safe zone within the city. To survive, they send out scavenger parties for food and medicine. Julie (Teresa Palmer), her boyfriend Perry (Dave Franco) and her friend Nora (Analeigh Tipton) make up one such party. While out on excursion, her group is found by R and his raiding party, who slaughters nearly everyone. R personally kills Perry, and, after eating his brain and experiencing Perry’s memories, R is overwhelmed by emotion when he spots Julie. He decides to protect her from his fellow zombies, taking her as a hostage of sorts and keeping her in his makeshift home on an abandoned plane. Clearly, something has changed in the human-zombie dynamic, and perhaps it’s this chance encounter between R and Julie that can save the world. While definitely a zombie movie, these aren’t the typical, permanently slow-moving, brain dead shuffling corpses featured in most genre films. These zombies can move quickly when they need to, they have thoughts and opinions, and they can even speak in limited phrases when necessary. This may disappoint audiences who are partial to traditional Romero zombies, since Warm Bodies is more akin to the Return of the Night of the Living Dead films, which introduced brain eating to the genre. The filmmakers ingeniously built on that concept, explaining how zombies are able to relive the memories of their victims through this process, and why zombies covet the brain so much. It’s a great mechanic, and one of the few surprises in the film. Fortunately, the filmmakers introduce the zombies early and are consistent in their concept, so audiences of all zombie persuasions will quickly learn to accept those featured here. The only lapse in logic comes with the Boneys who are inexplicably faster and stronger than regular zombies – and even humans – despite being near-skeletons. The story is rock solid, considering that the plot has been tested time and time again since the days of Shakespeare, and the cast handles their roles admirably. Most notable is Nicholas Hoult as R. It must be a unique challenge to find ways to be expressive within a non-expressive character. R doesn’t even seem to blink at all. Yet, Hoult manages to carry the film handily, earning audiences’ sympathy with every action and audiences’ laughter with his dry delivery during his voiced-over inner monologues. Surprisingly, the film is presented much more seriously than one might expect from a romantic comedy featuring zombies. There aren’t many gags in the film, but when comedy is needed to break up the drama, Rob Corddy as R’s best friend comes through in spades. For audiences who have seen the trailers, there’s very little to surprise them in Warm Bodies beyond the uncommon take on zombies. The predictability becomes more intense once an iconic scene featuring a balcony takes place early in the third act and suddenly all of the names and initials become clear. Nevertheless, predictability isn’t necessarily a hallmark of an unsatisfying film, and Warm Bodies strays enough from the story it alludes to in order to be its own tale. Overall, Warm Bodies is a fun movie and, while it’s early yet, this is easily the best film of the year. It’s smart, funny, and, best of all it knows exactly the kind of movie it wants to present and rigidly sticks to the plan. Impressively, Warm Bodies has created a concept that all zombie fans can put aside their differences and appreciate. For a film about uniting people, there’s no greater success than that.